A new five-year study of nearly 1,600 patients finds that genetic testing can help determine the safest dose of the blood thinner warfarin, with fewer side effects, in patients undergoing joint replacement surgery.The findings from the GIFT study are published in the Journal of the American Medical Association, and could be used immediately. Since 2007, the Food and Drug Administration has included language in its warfarin packaging that encourages the use of genetic guidance, if it’s available. Researchers in the national study, which included clinicians from Intermountain Healthcare, found that when doctors dose according to a patient’s genetic makeup when prescribing warfarin, a blood thinner commonly prescribed to prevent life-threatening blood clots, the numbers of adverse side effects like hemorrhage are significantly decreased. Warfarin is a commonly prescribed, very effective anticlotting medicine — but it’s often associated with adverse complications and each patient requires a different dosage to achieve the desired treatment effect.That unique dosing is based in part on an individual’s genetics, and great interest exists in understanding whether an individual’s genetics can guide how to best prescribe warfarin to reach the optimal therapeutic range. 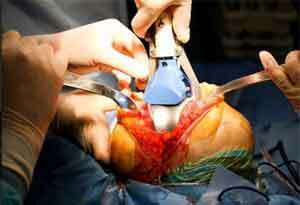 The five-year study among patients having an elective hip or knee replacement was coordinated at Washington University in St. Louis, and was performed at Intermountain Medical Center, Hospital for Special Surgery in New York, Washington University, University of Utah, Rush University Medical Center and the University of Texas Southwestern. Researchers say study findings from the GIFT study (Genetics Informatics Trial of Warfarin to Prevent Deep Venous Thrombosis) are significant. Compared to patients who received a standard dose, patients who received genetically-dosed warfarin had a 27 percent reduction in complications. Specifically, their major bleeding was reduced by 75 percent, the incidence of excessive international normalized ratios was reduced by about 30 percent, and blood clots occurred 15 percent less often. No patients died during the study. “Differences can be identified by looking at a patient’s genetic makeup, and specifically at the genes that are responsible for the liver’s metabolism of the drug,” said Scott Woller, MD, co-director of the Thrombosis Program at Intermountain Medical Center and principal investigator for Intermountain Healthcare. Researchers studied nearly 1,600 individuals age 65 and older undergoing an elective hip or knee replacement surgery. They found that tailoring the warfarin dosage to fit the individual’s genome resulted in reductions in four negative outcomes: Occurrence of a blood clot, major bleeding, an international normalized ratio reading greater than 4, and death. The international normalized ratio is the laboratory test used to assess warfarin’s effect, and the desirable range for patients after hip or knee replacement is 2-3. Patients in the trial were randomly assigned to one of two groups. One group received warfarin dosing based on standard factors such as age, height, and weight. The second group was dosed based on these clinical factors, plus genetic variants. Previous studies have shown how the various genetic differences, called polymorphisms, affect the metabolism of warfarin, Dr. Woller said. He noted that Brian F. Gage, MD, MSc, of Washington University, principal investigator for the entire GIFT study, played a significant role with other researchers in creating an algorithm that uses an individual’s genetics to prescribe a more precise personalized dose of warfarin. The algorithm weighs individual patient characteristics, such as gender, weight, age and race, as well as one’s genetics. Dr. Woller said it’s important to understand that the dose that will put a patient in the 2-3 international normalized ratio therapeutic range can vary greatly: Some patients require just 0.5 mg of warfarin a day, while others might require 15 to 20 mg a day.